By popular request, we've organised another Christmas Concert for 2018. Once again we'll be at the Drive Methodist Church on Clifton Drive South because of its terrific acoustics. We begin with an early one on 29th April then the first Sunday in June, July, August and September. And, of course, there's no charge for admission. 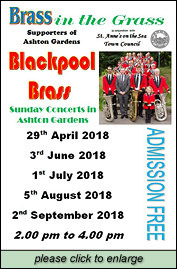 So why not come along and spend a sunny Sunday afternoon listening to the sounds of a traditional brass band in the grass of Ashton Gardens. We were fortunate to have these magnificent photographs of the gardens taken recently. Just click each of the images to see it at full size. 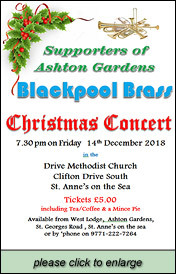 Following the success of the Sunday concerts it was decided to sponsor a Christmas concert by Blackpool Brass in the Drive Methodist Church, St. Annes. The excellent acoustics in this church are ideal for music being performed without the aid of amplification. A nominal ticket price of five pounds, to include a soft drink and a mince pie, was fixed. Tickets went on sale in September and the Committee waited with bated breath to see if they sold as the date of the concert was in the midst of many Christmas promotions in this area. Ticket sales were steady and by the date of the concert we had just about broken even on the cost of the venture. The 'icing on the cake' came on the night when ticket sales on the door and the support for our raffle exceeded all expectations. The 'feed back' from the audience as they departed was excellent and it was obvious that a very enjoyable evenings entertainment had been provided. In addition to this it transpired that the band had enjoyed the appreciation of their audience so much that they expressed a wish to repeat the event in 2018. The hall was booked and the band engaged before we left the building. A small group from Blackpool Brass played in the Gardens on the Centenary Celebration day. They enjoyed the response from their audience and expressed a wish for the whole band to perform some Sunday concerts here. Terms were agreed for five Sunday concerts, one per month from May to September and the St. Annes on the Sea Town Council granted some funding towards the overall costs. The free concerts attracted audiences that increased each month and we were blessed with four 'good weather' Sundays, only September had to be abandoned due to heavy rain. In 2016, we celebrated the 100 years since Lord Ashton's generosity secured the future of the gardens for the people of the St Anne's on the Sea. To find out more about the events for this celebration, please click on the Centenary Programme or the Poster to open it at full size. A grant from the Heritage Lottery Fund allowed SOAG to undertake a major project for the gardens. We have researched the history of how the gardens were made, and documented that story with over 3,500 images of documents and photographs. 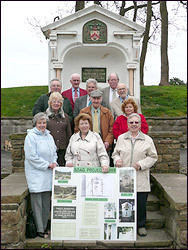 We presented the findings of that research at a major seminar in June 2011, and completed the restoration of the Lord Ashton Monument. 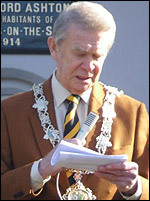 A handover ceremony saw Fylde's Mayor receive the completed monument from SOAG on behalf of the people of the town. The picture below shows SOAG's members celebrating the completed restoration. 25 June 2011 will see the findings of our research published. This was a major seminar setting out the history of the gardens from before they were first laid out, through their first layout by Edward Thomas, and onward to the story of how Lord Ashton became involved with St Annes and why he gave he gardens to the people. The seminar was in three parts. 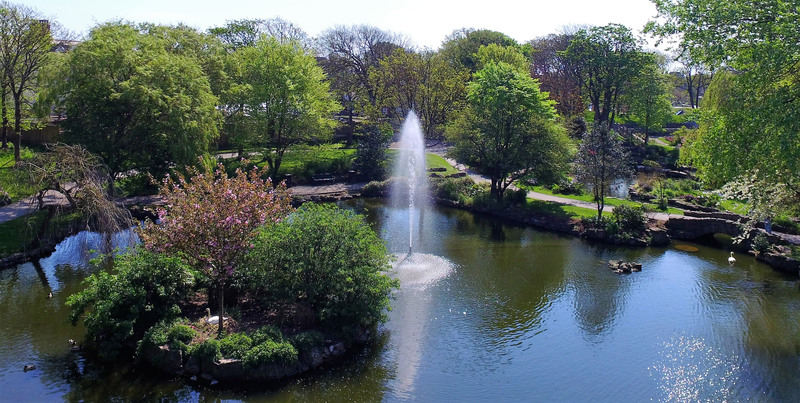 Firstly Ruth Thurnhill of the Lancashire Gardens Trust will set the scene by explaining how the public parks movement came about and which were the early public parks. Next, SOAG's Chairman - Fred Moor explained how the town and the gardens were created out of a sand dune wilderness. This included considerable information about Edward Thomas who first laid out the gardens. Finally SOAG's Vice Chairman - Jon Harrison - explained how and why Lord Ashton came to be involved and why he gave today's equivalent of £5 million to buy the gardens. We heard today (April 2010), that we have been successful in obtaining the maximum grant provided by the Heritage Lottery Fund under their 'Your Heritage' scheme. So this morning we took a celebratory picture of SOAG's Executive Committee who have worked hard over the last few years to prepare the bid to restore the Lord Ashton Monument in the Rose Garden. The really had work starts now though as we set about forming project committee and appointing architects and specialist contractors to restore the monument. We will also be undertaking research into the history of the gardens and the monument and will publish the findings of that work in the near future. We hope to hold a major seminar once the research is completed, and we expect to publish a DVD and to expand the website.